Iron Man faces his greatest test yet as each new version of Ultron grows more powerful! The Avengers 2: Book of Secrets toys were really not good. Oh, the two series of Legends were fine, but if you wanted to continue your collection of 4" figures from the first movie (and every film leading up to it), you were boned. There were a few figures available in the scale, but they only had five POA. Harking back to GI Joe figures like Starduster and Cutter, this three-pack features two minor repaints, and one new figure. 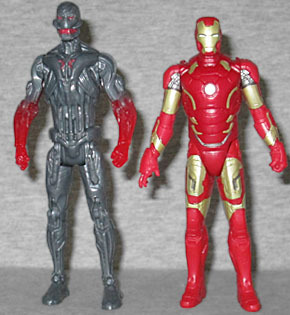 The rehashes are Ultron (supposedly the same "Ultron Prime" design as the BAF, but the sculpt on the back is different, and the proportions are weird) with translucent red forearms, and a Mark 43 Iron Man. Both figures have swivel hips and wrists and balljointed heads. They come with translucent energy effects that fit over their hands, but that's still not enough to make them interesting. 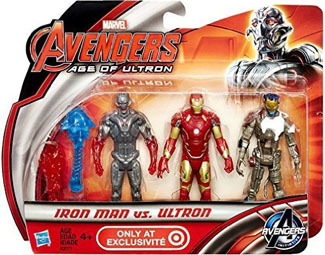 No, the thing selling this set is Ultron Mk I - you know, the one built from leftover "Iron Legion" parts right after Ultron came online. People have made customs of the Mk I, and there was a version in the 2.5" line, but the only way to get him in the 4" scale was this Target-exclusive set. The MkI was designed by Trixter Film, an effects house in Munich. The design had to both look cobbled together, but it also had to display an advanced intelligence behind it, so that we would believe Ultron could rebuild himself into something better. Marvel's directive was that they make "a spooky, creepy creature made of mechanical parts, glowing eyes [and] dripping oil," and boy did they deliver! Since his body is made from Iron Legion leftovers, the faceplate looks a lot like Iron Man. Yes, it's cracked and pitted (because apparently the citizens of Sokovia just randomly carry around jars of acid) and there's a big chunk missing in the "brain" area, but the lineage is clear. Also, you can see where it's going: Ultron has crafted himself some little ear-antennae that the Legionnaires didn't have, but are a trademark part of Ultron's constant look. The sculpt really is done nicely. We can see lots of pistons and wires, which would once have let the unmanned drone move around, and some shattered armor on the chest, shoulders, forearms and calves. A gap runs all the way through the center of the torso, helping make clear that this is not a man in a suit. It's a weird, asymmetrical design that suits him perfectly. Unfortunately, all the sculpted details in the world mean nothing without good paint to back them up, and this figure does not have good paint. It's molded in basic grey, and that's what color most of it stays. Oh, the head is dark blue, with a gold face and light blue eyes and mouth, and a few of the armor plates on the body get apps of white, dark red, or blue, but there's no shading, no variation of tone, nothing. 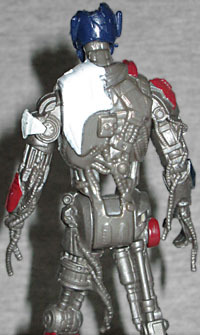 In the movie, Ultron MkI was rusty, greasy and built from patchwork parts that didn't quite match one another, but none of that made it to the toy. Somthing else that didn't make it to the toy? His posture. The Mark 1 was a hobbled, hunchbacked mess - in order to get the proper stance during motion-capture, James Spader had his arm in a sling and weights on his legs. And what does this toy do? Stands him straight the hell up. 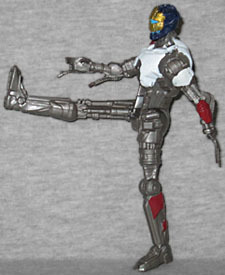 And because the toy only moves at the hips, shoulders and head, there's no way you can even duplicate the pose on your own. So once again we see the thing we've been trying to impress upon toymakers for years: a toy with articulation is every time better than one without! Target originally wanted $15 for this set, but with only one new character and two who are kind of garbage, it wasn't worth that. It eventually made it to clearance, and then bonus clearance, and then finally Target's Cartwheel app had an even bigger bonus on all clearance items, which is when I finally bought it. You're really paying for nothing other than a piece of scenery to put in the back of your display, and at that point, you could just print out a nice, hi-res image of the character, glue it to some cardboard and get the same effect. 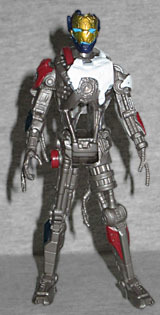 Yes, Ultron MkI is supposed to be junk, but not like this.